When it comes to the ultimate outfit finishing touch, for me there are two failsafe options—a great pair of earrings or a swipe of lipstick. Recently, though, I've noticed that one of my favourite Instagrammers consistently takes things one step further and matches her makeup to her ear accoutrements. 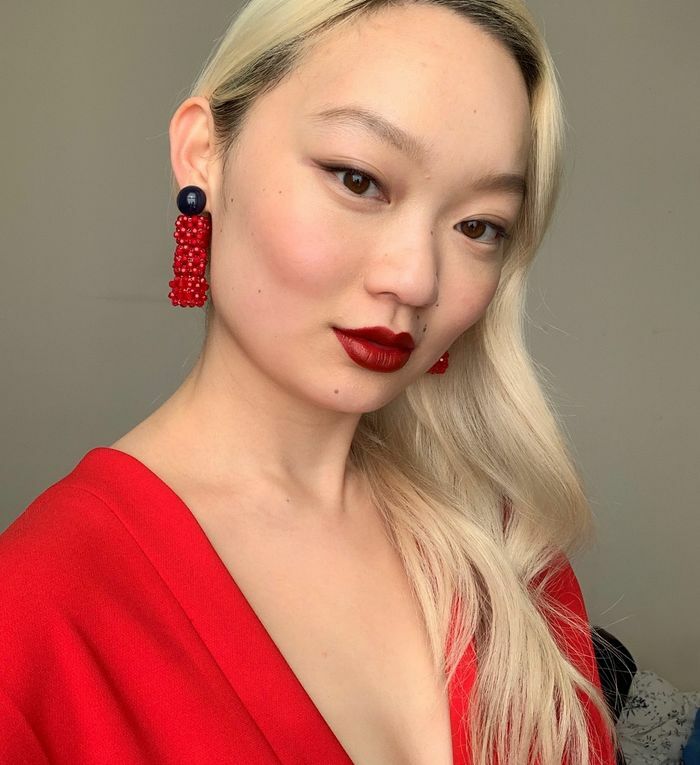 Yes, stylist and model Jessica Wu certainly knows a thing or two about creating a monochromatic makeup-and-accessories statement. Not only does her matchy-matchy approach take the level of polish up a notch, but I reckon it will hold definite appeal for anyone whose uncertain about how to pair their style with their beauty look. Scroll down for the makeup-and-earring combinations from Jessica's Instagram feed that you won't want to miss. To avoid looking like you work for the Royal Mail, keep your shade of lipstick muted—burgundy and claret are great hues to try—while your accessories and apparel can shine bright in a palette of poppy reds. You couldn't move for these tasseled earrings on the high street last summer, and I have a feeling we'll be seeing them again this year. I must admit that I fell in love with this lipstick on packaging alone. Thankfully, the rich, velvety formula delivers on colour and comfort. Hoops are a great everyday earring staple but this resin pair is an artsy take on the trend. New from Bobbi Brown, this formula combines the pigment of a lipstick with the comfort of a gloss for a fuss-free statement lip. From the tailored power shoulder of the pastel pink blazer to the eclectic earrings, this pretty-in-pink look is giving me serious '80s vibes. Keep the makeup feeling fresh by choosing cream formulas that can be patted onto eyes, cheeks and lips for a barely-there flush of pink. These blossom drop earrings are seriously pretty. I'll take one in every colour. A verstaile pigment that blends seamlessly onto your lips and cheeks using only your fingertips. Wear these cute '80s-esque drop earrings with pastel tailoring for a full power-suit experience. A little goes a long way with this. Dot just once onto the apples of your cheeks and blend for a youthful flush. I've always struggled with styling statement drop earrings, like these ones from 3.1 Phillip Lim, for daytime wear. Although they undoubtedly make an impact, there's something about the cool-girl smudge of denim blue eye shadow that brings the look down from corporate to casual. Wear with jeans and a tee (or your best '90s slip dress). Wear one in each ear for seriously dreamy vibes. Use an angled brush to apply these shimmering navy shades close to your lash line if you don't fancy a full wash of colour. I've earmarked these iridescent blue earrings for summer thanks to the mermaid vibes that they're giving me. Use your fingertips to smudge this onto your eyelids for a carefree approach to colour. A hot coral lip and plush peachy earrings lend this look some major "can summer arrive already?" vibes. Keeping the rest of the look simple with a glossy eyelid and strappy cami lets the makeup and accessories take centre stage. This geometric pair are perfectly peachy. If you're going bright, choose a long-lasting formula to keep the look as low-maintenance as possible. They might be a little Ibiza beach club, but keep the rest of your makeup simple and your hair disheveled, and I think they could work. Go next-level matchy-matchy by patting this colour onto your lips and cheeks. I don't think I've worn silver eye shadow since my mum threw a family party on the eve of the millennium. However, I'm rushing out to embrace metallics on both my face and my lobes with this cool look. Dressing down the jewels with a casual white tee is a stroke of style genius. These earrings are seriously special. To avoid looking like the Tin Man, I'm not about wearing this on face, eyes and lips. There's no doubt that it looks spectacular on eyelids, though. A little vintage glamour comes courtesy of this purse-friendly teardrop pair from Warehouse. An icy blue undertone prevents this eye pigment from looking too stark. Next up, bold eye shadow is back—and these are the trending colours of 2019.